‘WINDMILL’! she victoriously bellowed… .again. Road-tripping with my Aussie wife across swathes of seemingly deserted Australian countryside can be a noisy affair. Windmill spotting, she tells me, is a good way to pass the time – especially if we make it a competitive game. And there certainly is a lot of time on these trips, and a lot of nothingness. Signs that say ‘Next McDonald’s in five hours’ drive that point home! As a Brit I’m used to road-trips punctuated with villages, towns and frequent motorway services. We don’t really go far without street lights, evidence of people, fields of cattle or crops. This makes our antipodean jaunts feel very different, more endless. No people, no homes, no crops, no evidence of life. Just barrenness. Habakkuk 3:17-19 often comes to life for me in times when I feel as though life is stretching ahead in real barrenness. Heaven seems closed, the days feel sticky like treacle, I see no fruitfulness in ministry, or experience no sense of refreshment. Recently this feeling of endless weary-making wilderness has come my way through bereavement. I lost my brother and mum within a few weeks of one another – and the grief feels like endless nothingness. YET, just like on our deserted road-trips, I am discovering that calling out a God-focused ‘WINDMILL’ cry really helps! On our travels, shouting ‘WINDMILL’ signifies that we’ve spotted a sign of life. We have made progress along an endless road, we are at a new point on our trip. The windmills remind me that someone else is in that barren place and that energy is being gathered to fuel something that, though I may not be able to see it, is life sustaining. ‘….YET I WILL REJOICE IN THE LORD’. I am learning that if in my wilderness I choose to proclaim unchanging truths of Christ, who he IS and the reality of his power in my life, I AM sustained! Lord God, I will choose to cry out to you in praise. You are present, you are powerful, you give me life. Even in my days of nothingness, even in this wilderness you ARE my strength, Jesus Christ you are my salvation. Note: From September 2019 Ruth takes up her first appointment as an Ordained Methodist Minister, where she will be based with her wife, Helen, in Pontefract in the Yorkshire West Methodist District. 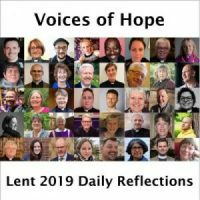 This entry was posted in Guest Contributors, Voices of Hope. Bookmark the permalink.